Writing history is a lot like doing a massive jigsaw puzzle, only most of the pieces are missing. We sometimes wonder why we bother, but occasionally we’re able to fit a couple of pieces together and that is always very satisfying. “This 219 ton ship is the largest fishing vessel now in Korea; she will serve as a floating laboratory for the re-institution of deep sea fishing, which during the Japanese regime, had been monopolized by Japanese firms and fishermen,” according to an Economic Cooperation Administration document that we trawled up (sorry, sometimes we can’t resist) in our last visit to the National Archives, in Washington, D.C. This particular report is from the files of the Supreme Commander Allied Powers, or SCAP, the American occupation of Japan (Record Group 331, if there is anybody out there who can be impressed with a really esoteric bit of trivia). 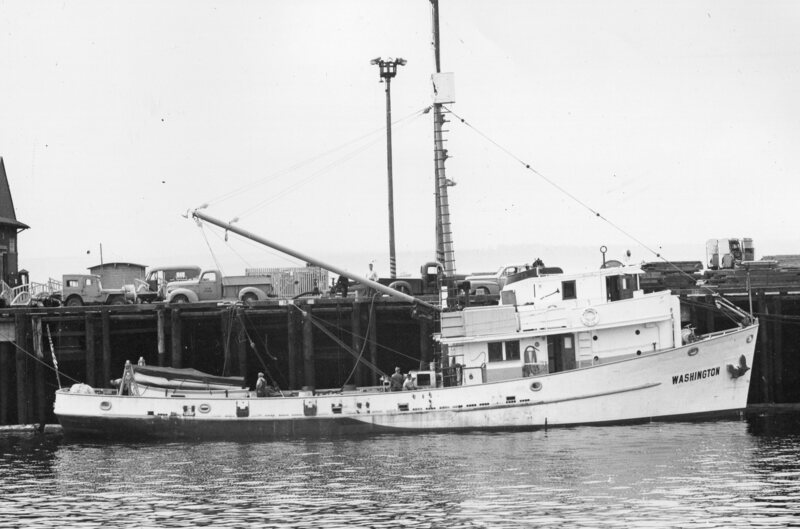 The Washington was one of four vessels built to fish for the Pacific Explorer. The vessel was transferred briefly to the U.S. Fish and Wildlife Service, then sold and the money went to build the R/V John N. Cobb. Bob Hitz has dug up the bill of sale. And now we have some details about what the new owners intended the vessel to do. The Americans started planning for the Occupation of Japan in 1942. But they really didn’t do any planning for the Occupation of Korea. The Japanese invaded Korea in 1905 and proceeded to behave as a colonial, occupying power always does, developing resources to benefit the home country. According to the report, the Korean fishing industry was about the same size as the American industry in 1937, landing some 2.1 million tons and employing up to 500,000 Koreans. With the end of the war, Koreans were starving and dependent on imported food. One of the first efforts for the Americans was to restore the fishing industry as quickly as possible—just as General MacArthur did during the Occupation of Japan. One of MacArthur’s first orders, after the surrender, was a freeze on the movement of all Japanese vessels, including fishing boats. The Japanese had fished widely through Southeast Asian waters (there is a good book on this, The Closing of the Frontier: A History of the Marine Fisheries of Southeast Asia, 1850-2000, by John G. Butcher) and some of their largest and best equipped vessels were in the waters of other countries. Several countries, including Korea, proceeded to seize the Japanese boats. This created a dilemma for the Occupation. On the one hand, it wanted to rebuild the Japanese economy as quickly as possible, and to get boats back fishing, to provide much needed food for the country. But the Koreans also wanted to get back to restoring their economy and rebuilding the fishing industry. It was difficult. The Japanese had known where the fishing grounds were and they had only given technical training to their nationals; there was a shortage of navigators and engineers. It was impossible to get spare parts; the ice plants were shut down, the canneries closed. The Military set about restoring the Korean fishing industry as quickly as possible. The emphasis was on shifting from immediate relief to a program of rehabilitation. They wanted to rehabilitate the Korean boat building industry and they were busy transferring technical information on fisheries through a technical training division. There are no further details in the document about the arrival of the Washington and an account of how it fared in its important new role. With the building of the Cobb, the role of the Washington in the development of West Coast fisheries science has been erased, until Bob Hitz started poking around, in the best historian tradition. The next time we are at the National Archives, we’ll be sure to get back into Record Group 331 and see if we can ferret out the fate of this Pacific combination vessel in its new home. And maybe we’ll get a couple more pieces to fit into this particular section of the great big jigsaw puzzle, the history of the development of fisheries in the Pacific. 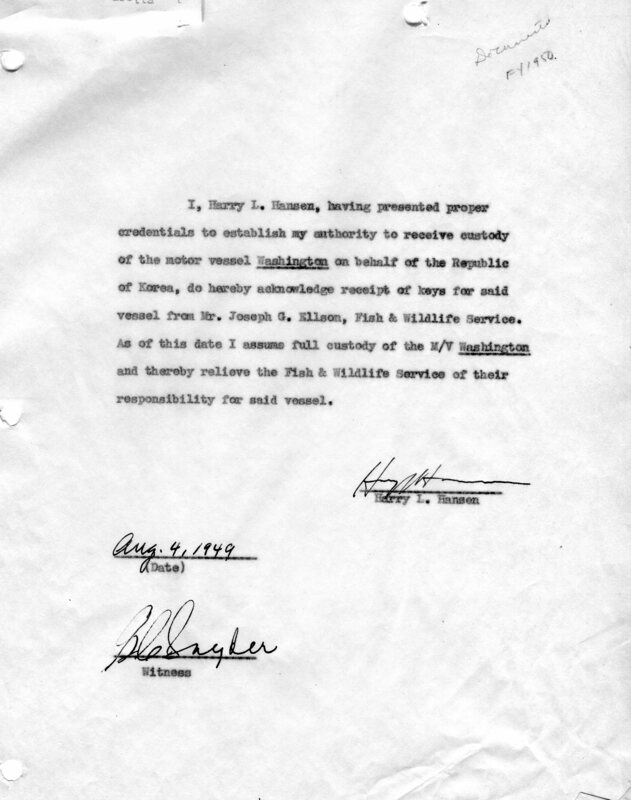 National Archives and Records Administration, RB 331, Box 8936, Economic Cooperation Administration Mission in Korea, undated. This entry was posted in boat building, Cold War, Environmental History, Exploratory Fishing Base, fisheries science, Fishing, History of Science, History of Technology, Japanese fishing, Maritime History, Nick Bez, Ocean fishing, Pacific Explorer, Pacific Fishing History Project, R/V John N. Cobb and tagged Bering Sea, Carmel Finley, Fisheries Science, groundfish, Pacific Fishery History Project, science, trawling. Bookmark the permalink.